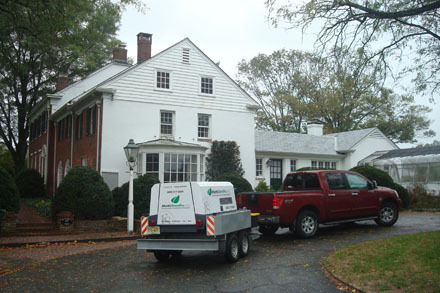 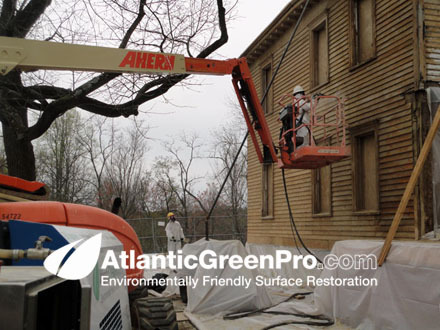 AtlanticGreenPro has solutions for for just about any surface restoration project. 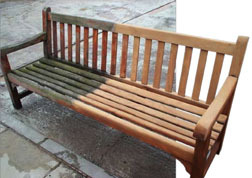 Our team of professional utilizes the the best and safest processes to remove and clean most any surface coating from just about any wood surface imaginable and we do it without damaging the environment with harmful contaminates. 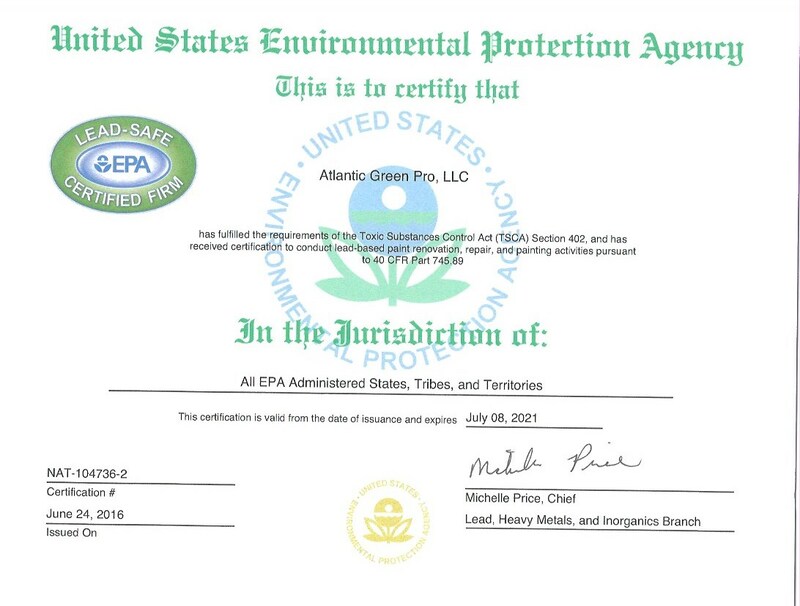 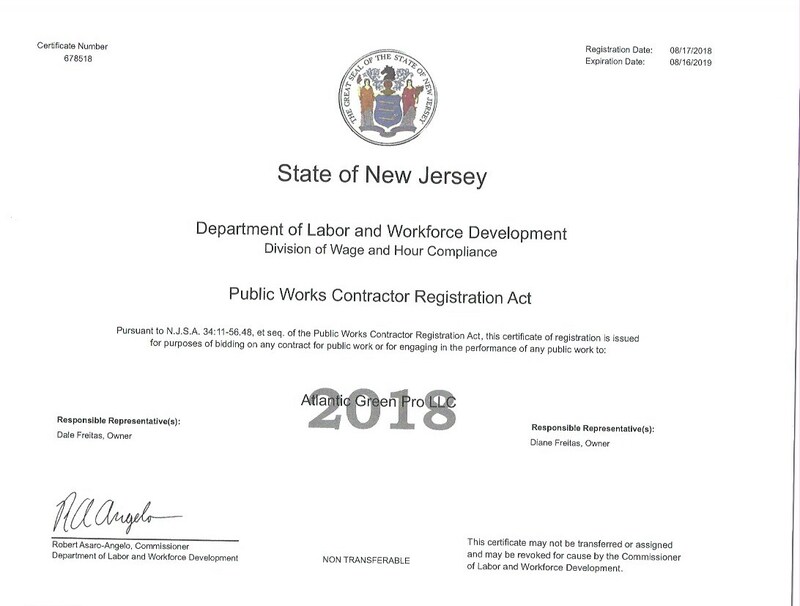 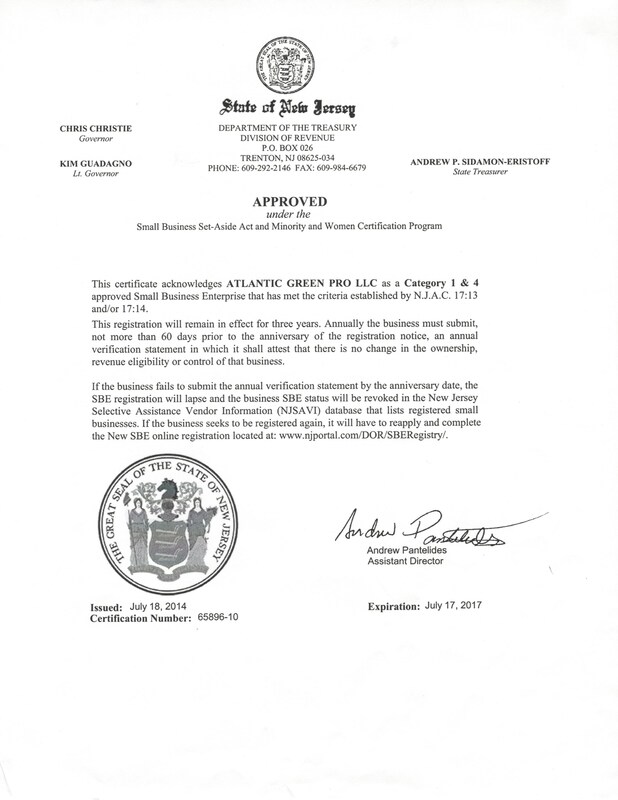 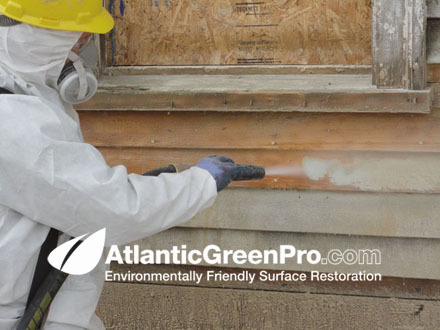 AtlanticGreenPro employs only green products such as recycled glass, walnut shells, corncob, sodium bicarbonate (soda blasting) and even green chemical strippers and cleaners when needed. 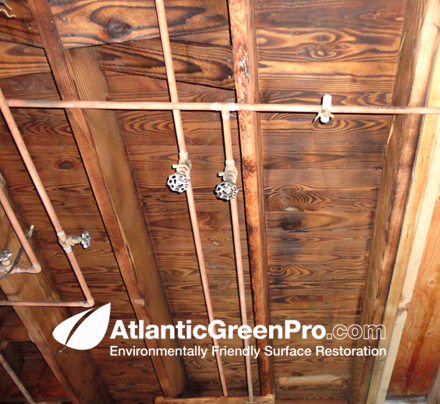 Below are just a few examples of some of our recent work. 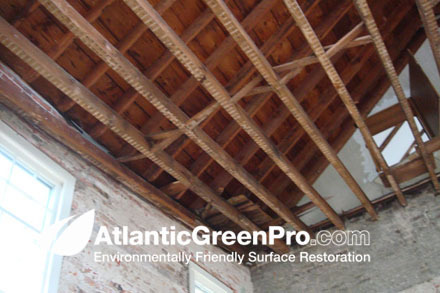 Princeton New Jersey area wood Restoration. 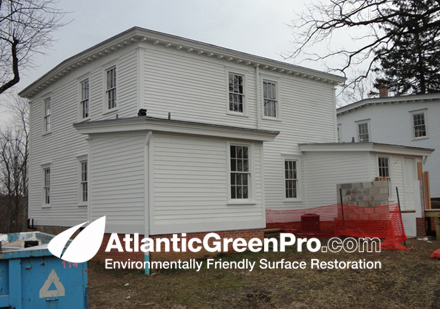 This is an old estate home with sections dating back more than 200 years. 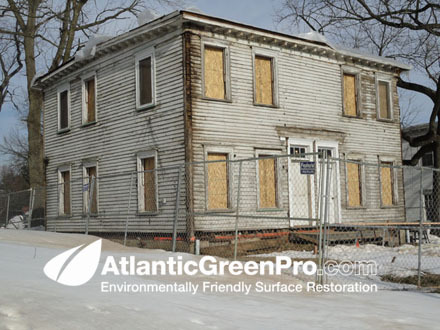 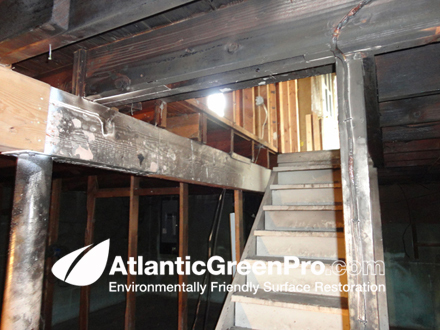 Our client is in the process of converted it in to a restaurant and Atlantic Green Pro was asked to clean and restore the wood to it's original condition. 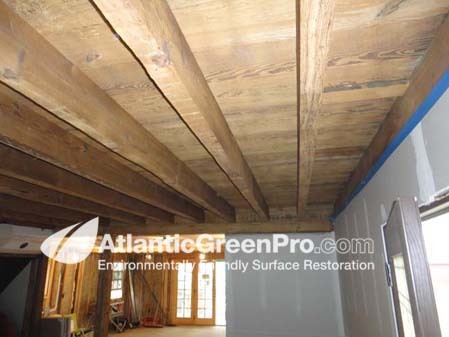 Example of wood ceiling after restoration this is an example of what the client was looking for as far as finished product. 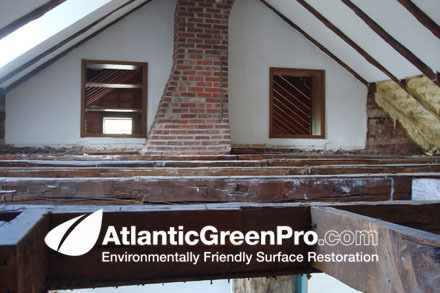 Atlantic Green Pro stripped the old wood of plaster, paint and the age of time back to it's original look so an oil based sealer could be applied. 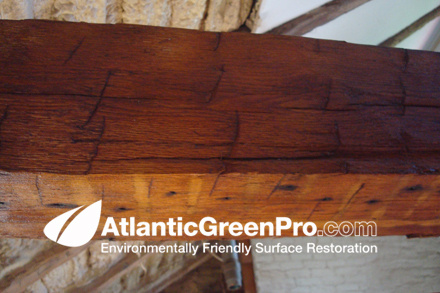 Example of OLD wood ceiling beams before restoration this is an example of old wood beams before Atlantic Green Pro stripped cleaned the old wood plaster, and paint from them. 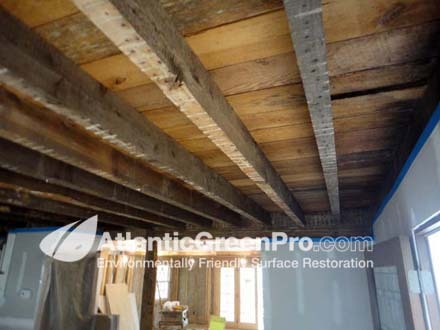 Same OLD wood ceiling beams after restoration this is an example of what the old wood beams looked like after Atlantic Green Pro stripped and cleaned the old wood. 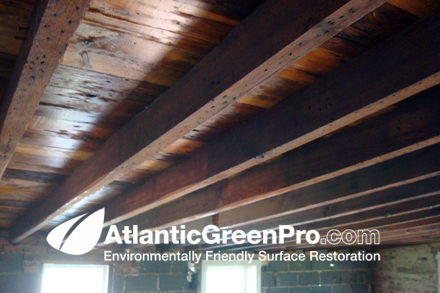 Same wood ceiling beams after restoration and oil based sealer applied. 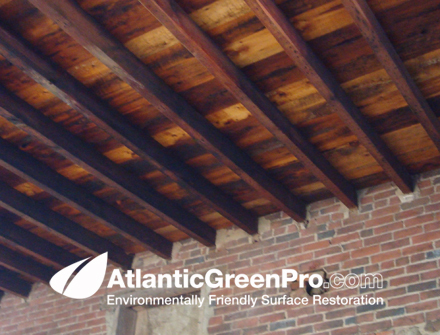 Same wood ceiling beams after restoration again this is an example of what the client wanted after oil based sealer was applied. 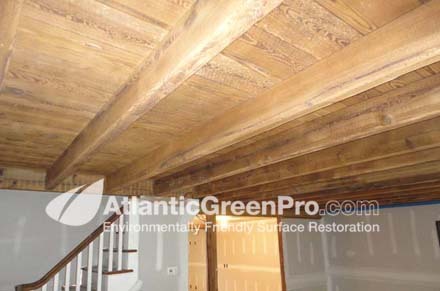 Same OLD wood ceiling beams (Close up) after restoration again this is an example of what the client wanted after oil based sealer was applied. 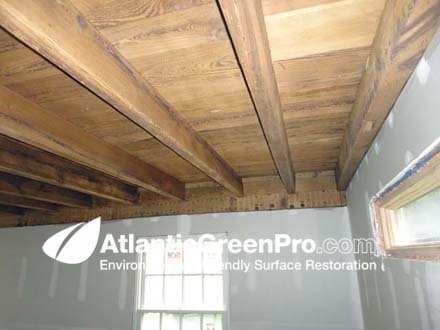 Same OLD wood ceiling beams after restoration this is an example of what the client wanted after they were blasted and oil based sealer was applied. 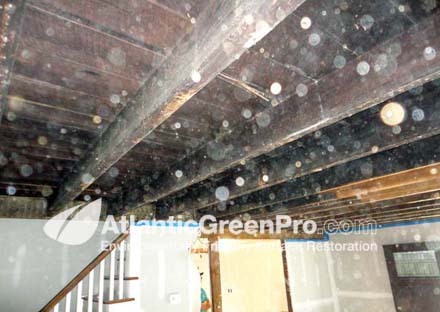 This is a recent project we did where we were called in to strip the wood ceiling of soot and mold damage. 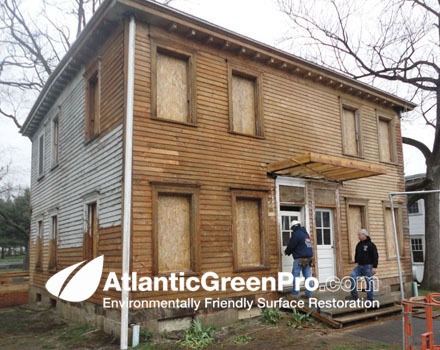 The house was undergoing a full renovation and we choose to walnut shell blast it so that the full natural look would come out. 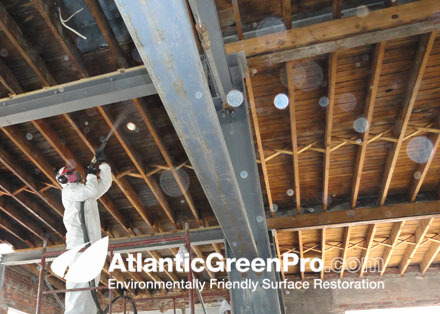 During wood restoration process: Atlantic Green Pro's wet abrasive process removes multipul coats of paint without producing huge amounts of dust like dry blasting. 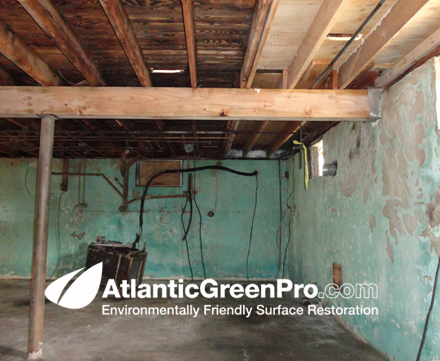 During restoration Here you can see the process in action, the process uses recycled glass... the same stuff you put out on the curb for recycling, along with a small amount of heated water and compressed air... it's a very green process. 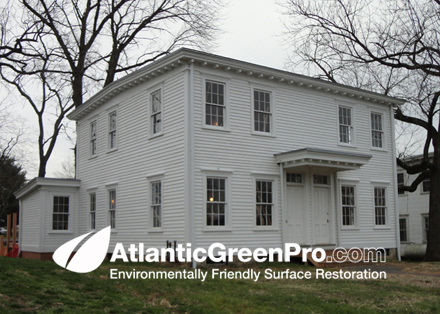 After restoration As the house looks all finished. 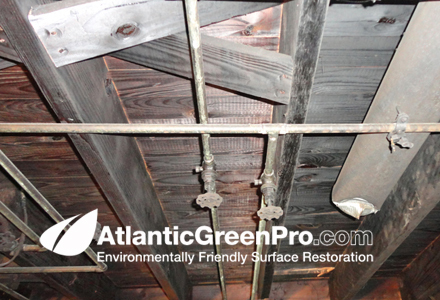 Old New Jersey Warehouse wood ceiling restoration. 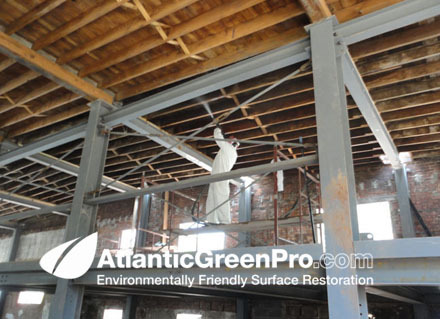 This was a recent project we did where our client was converting an old warehouse into retail space. 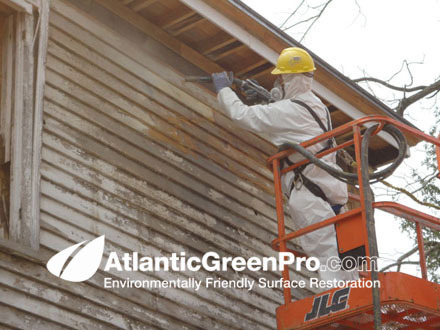 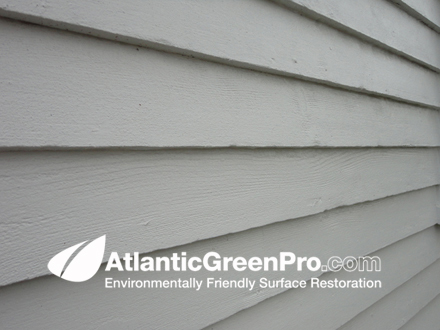 Our Atlantic Green Pro surface restoration process brings old wood back to like making your next real estate conversion a true success. 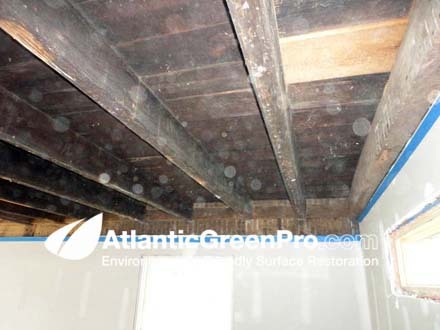 During restoration Here you can see the restored wood and the section being restored... note how there is very little if any dust. 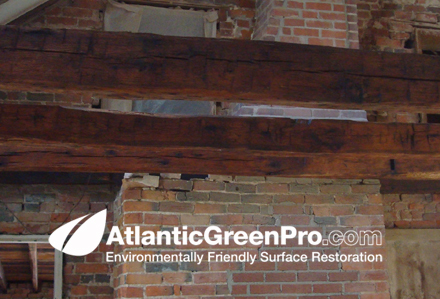 During restoration Here's another angle of the wood being restored and the section of wood that was already restored. 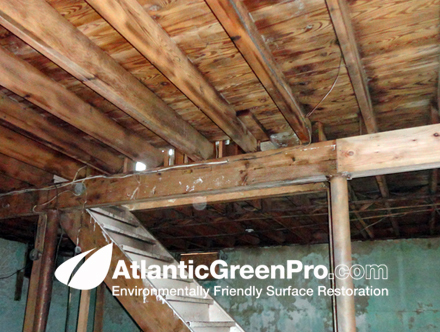 During restoration again wood being restored and it doesn't disrupt other construction going on in the building. 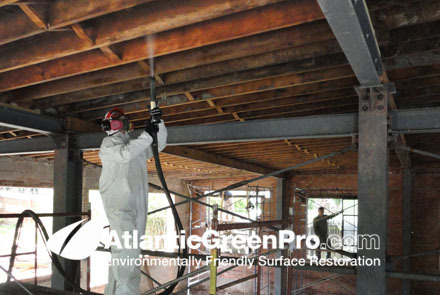 A big part of what Atlantic Green Pro does is both Fire and Mold restoration of wood surfaces. 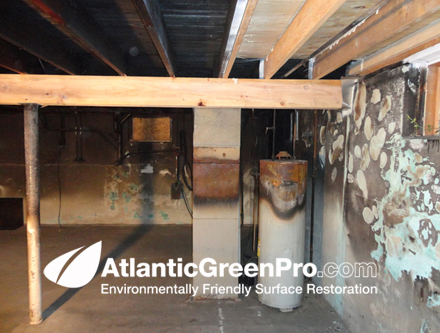 Below is a series of photos showing what we were able to do to the basement of this home which had a hot basement fire both burned and coated the wood with soot. 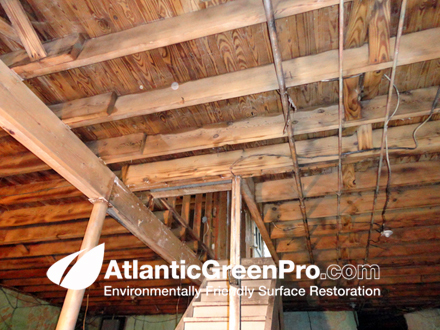 Interior ceiling where fire took place Here you can see where the contractor sured up areas that required new wood and the wood that was burned which we were asked to restore. 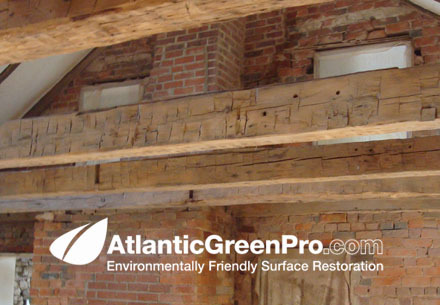 Again interior ceiling where fire took place Here you can see the burnt wood beam that we restored to like new condition. 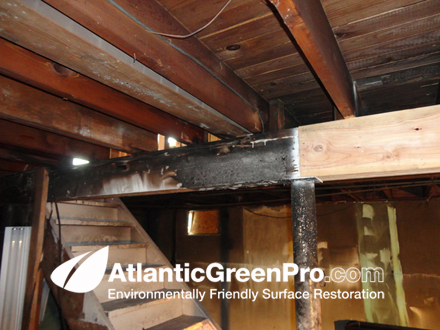 Again interior steps leading into basement where fire took place Here you can see the burnt wood beams that we restored to like new condition.